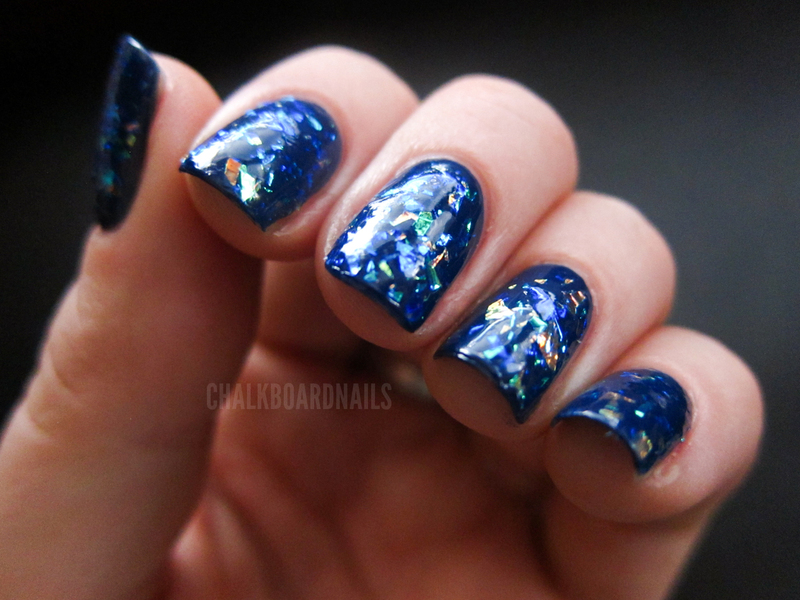 Hello readers, I have a quick nail of the day for you here! 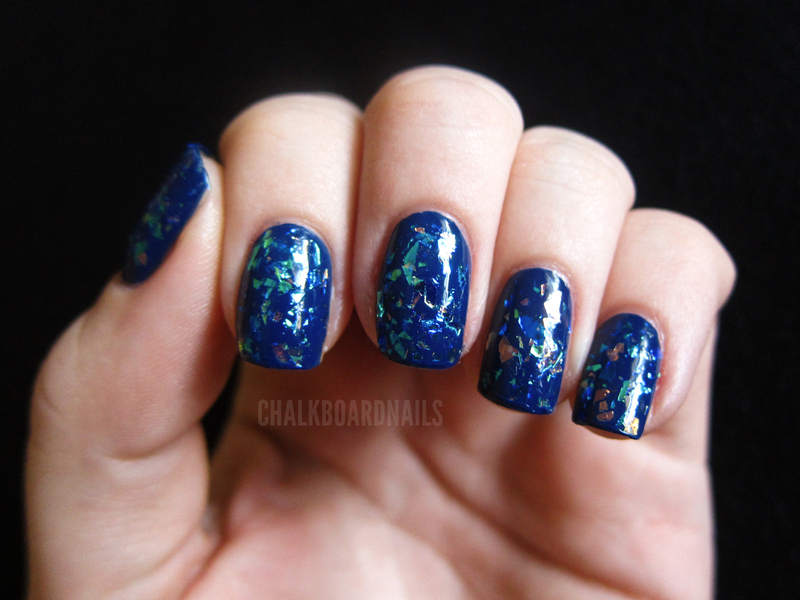 This is China Glaze First Mate, a very pretty dark blue creme, with Color Club Covered In Diamonds over it. I love Covered In Diamonds but MAN is it a pain to apply! I put on my first coat of CID, and then let it dry for a bit. I then added bits of the polish to some of the bald spots, and let it dry until it was still pliable but not tacky. I then used a light press of the finger on top of the mani to try to flatten all of the shard pieces because this polish, if not carefully applied, can get REALLY bumpy. Obviously I topped with SV - two coats this time. Unfortunately when I woke up to take my pictures this morning, I discovered that the SV had caused some shrinkage! This can happen when your Seche gets too thick - it shrinks up as it dries and pulls the polish back from the tip of your nail. You can solve it by adding nail polish thinner to it, but unfortunately for this mani it was too late. I added a bit more First Mate to the tips to cover it, but you can still see the shrink ridges. This polish reminds me of OPI's I Lily Love You which was a PITA to apply too. It looks lovely though! I have that China Glaze First Mate-such a pretty blue-I thought it was my CND Super Shiney that was causing the shrinkage-maybe its the first layer of Seche-and it's brand new! I'll add some restore and see if that helps! This is so pretty! That stinks that is was such a pain to apply! BTW as I read you title I totally sang "Ice, Ice, Baby" and did the little dance! Just had to share hehehe! Wowwy!! This is flipping gorgeous. Oh this is grogeous! I *need* covered in diamonds! 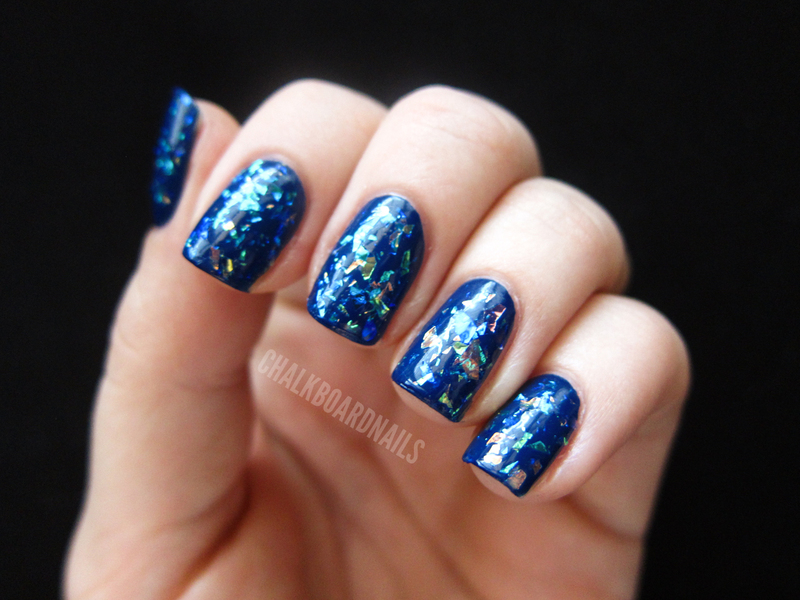 What an amazing polish! It looks like crystals! So pretty! I just love manicures like this! I am so jealous of flakie polish manicures. I have yet to own a flakie polish and it is KILLING me. My first flakie may be unicorn puke, lol. This is gorgeous. I want it! FWIW I just read on another blog that SV can be a problem with newer polishes because it has toluene in it. A lot of people use a regular top coat before SV to avoid the problems. This is just what I read-I have no personal experience with it. I don't care how it goes on! It's amazing!